I’m about to take you on a brief but uncomfortable journey into the land of tin foil hat wearing conspiracies. I’m not going to ask you to believe it, just consider it. Think about it. Think outside the box, and as you do, consider all that has taken place over the last few decades, with particular emphasis on the last five years. Listeners to The Hagmann & Hagmann Report and my appearances on other radio programs might recall my source within the Department of Homeland Security making vague references on at least two occasions to the fictional novel written by John Grisham titled The Pelican Brief. The book came out in 1992 and was made into a movie in 1993 starring Julia Roberts and Denzel Washington. There was no clarification and no clarity offered by my source in terms of the reference he made. I was just told to keep that book/movie in mind in the coming weeks and months. Given the passage of the Affordable Care Act with Supreme Court Justice John Roberts as the deciding vote, the reference to The Pelican Brief might be making more sense now. Did Roberts appear comfortable in his public pronouncement with regard to “Obamacare?” Did you look into his eyes, the window of one’s soul when he made his announcement? To those with discernment, what did you see? Remember, this is the same Supreme Court Justice who “flubbed” the swearing-in of Barack Hussein Obama, requiring a do-over behind the scenes. 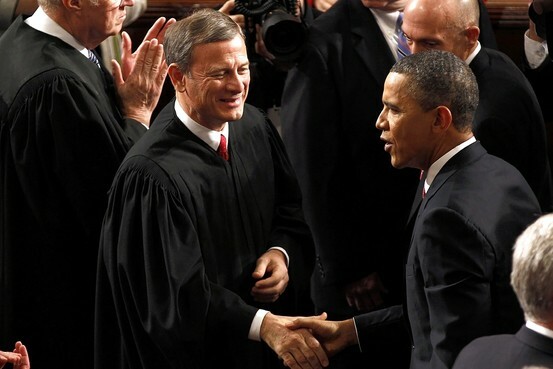 No video, no audio, no exposure of the “legitimate” oath given to Obama by Roberts. Does anyone outside of that room know what was really said at that private, unprecedented swearing-in ceremony? Like I said, folks, it’s full blown tin-foil hat territory in which we are now treading. But just hang in there with me for a bit longer, and maintain your ability to think outside of the box. It is the stated goal of both the communists and the Islamic terrorists to destroy the free, representative republic known as the United States of America. Perhaps more appropriate, to turn the nation into a communist country or see the flag of Islam flying over the White House and all of America, a step toward the oppression of global governance. Read the Communist goals that were read into the Congressional Record in 1963, and look how many of those objectives have already been accomplished and implemented. Is that a conspiracy theory? I contend that anyone with reasonable sensibilities would agree that the objectives and their implementation is based in fact. With regard to Islam, look at the charter of the Muslim Brotherhood, and note that the Muslim Brotherhood has infiltrated the U.S. State Department much like the Communists in the McCarthy era. Ten years after 9/11, we now have Islamic representatives influencing and dictating security to the Department of Homeland Security. Could this be purely oversight? I don’t think so. Note that the Communist Party USA (CPUSA) is fully backing a second term of Barack Obama,(link here) further calling it “imperative” that he is reelected. During Obama’s first term, we’ve seen some of the most overt Marxist and Communist leaning initiatives launched by Obama, with nary a peep from our elected officials on either side of the aisle. How is that possible? This writer first disclosed on this web site, with founder and editor Judi McLeod, that members of the media were being systematically threatened into silence over Barack Hussein Obama’s Constitutional eligibility to hold the office of the President. We presented redacted portions of a statement obtained from a well-known (but identity protected) talk show host substantiating this behavior. We turned over the information to the Maricopa County Cold Case Posse, including Sheriff Joe Arpaio and lead investigator Mike Zullo, the very information to substantiate our claims. They investigated and publicly confirmed our findings. Those who dared discuss Obama’s eligibility were threatened, harassed, and even placed under surveillance. If the issue of Obama’s eligibility is such a fringe issue embraced by only lunatics and racists, why such a response? Today, after nearly four years of Obama occupying the White House, we have no truly legitimate verification of who this man is, who was behind his meteoric rise to power, what his legal name is, or his parental lineage. For the self-proclaimed most transparent administration in history, it has been anything but. The well-researched inconsistencies surrounding this man could fill multiple books, and they have. But such inconsistencies are beyond the scope of this article. To those who treated the issue of eligibility as a fringe topic and a distraction, perhaps hindsight will prove that the issue had everything to do with loyalty to our Republic, just as it was initially intended by our founding fathers. Loyalty is anything but “fringe” or a distraction. Who occupies the White House? Given the level of deliberate disinformation, the withholding of Obama’s vital bona fides, the suspicion over the legitimacy of his birth records, his social security number, college transcripts, and so on, do you really know who this man is? We know he attended a Muslim school, and described the Islamic call to prayer as one of the most beautiful sounds he’s ever heard. We know he also attended a church that taught Black Theology, although did his best to distance himself from both ideologies for the purpose of his campaign. In reality, however, we know less about this man than we do his dog. Considering that, is it beyond the realm of possibility that this man was selected to advance a specific agenda? Many factors prohibit the takeover of the United States by military might. The best chance for success of capturing the United States and turning it into a Marxist, Communist, or Islamic country is from the inside. Those who believe that the plans are in place for a “New World Order,” or one world governance via the United Nations understand that certain ideological, moral and political principles must be neutered. The United States, as a sovereign nation, is an impediment to such plans, unless a “Manchurian Candidate” could be snuck in to the highest levels of government. Meanwhile, that individual could use certain groups, unelected officials, and a series of executive orders to implement the diabolical plans of the globalists, as global governance is the dictatorship of the proletariat under the umbrella of Communism. Islam is the key to erode the Judeo-Christian heritage on which this country was founded. The systematic takeover of the U.S. did not happen overnight, and not a shot needed to be fired. The spirituality on which this country was founded has been under attack for decades. God has been removed from nearly every aspect of public life, and our once distinctive morality that separated us from other nations has been bastardized. Map out all significant events beginning with World War I, the establishment of the Federal Reserve, the League of Nations, the United Nations, FDR, Watergate, Iran Contra, 9/11, and all other incidents of historical importance. The common threads that comprise this takeover from within all encompass government sanctioned deceit at various levels. I contend that our country is filled with enemies of the rule of law, the U.S. Constitution, who are working against the principles on which our once proud country stood. If you cannot see the changes, you can certainly feel them. If you cannot feel them, then it is my contention that your moral compass needs to be recalibrated. The Republican-Democrat, right-left paradigm touted by so many television and radio mouthpieces is essentially dead. It has been replaced with an Oligarchy, a nation of powerbrokers, “kleptocrats,” and “banksters.” Most leaders of America have succumbed to greed and power. Anyone who has researched the “affordable Health Care Act” knows that it has more to do with power and control than health care. That said, today’s decision was another nail in the coffin of our country, compliments to the Supreme Court. Let’s take a brief look at what happened today, and how this vote came to be. The bill was passed without it having even been read, and pushed through the system in a manner never before seen. People scoffed at the existence of death panels, tax funded abortions, rationed care, and so on. Even in the face of proof, buried within the bill, all have been verified to exist. The bill takes aim at state’s rights and personal freedoms and liberties, which are cornerstones of a free America. The bill pits government against religious beliefs, although will allow exemptions for the protected ideology of Islam. The bill wages war against Judeo-Christian faith, and it does so overtly, despite the hollow denials of Obama himself. It was Chief Justice Roberts who is labeled as the man who changed history by siding with the justices having a track record of curtailing the liberties of American citizens. It was the same man who swore in Obama in the do-over, in private. It was the same man who had the look of pain and conflict in his eyes as he announced his decision. Could it be that Chief Justice Roberts, through threat or duress, or some other knowledge or circumstance was compelled to make this decision in the same manner we now know the 2008 bailout decision was made - by the threat of domestic economic Armageddon? Before dismissing this as pure lunacy, I again urge you to think, analyze, research, probe, and search thoroughly and carefully the events of the last few years. Economic collapse is on the horizon, although most refuse to believe that financial Armageddon is a certainty. This, despite the unsustainable growth of our debt. And what about all of those Executive Orders? How about the passage of a bill that defines all of the U.S. as a battleground? How about the 450 million rounds of ammunition ordered by DHS? The bullet proof booths, the VIPER teams, the TSA, and so on. What about the most recent Executive Order, signed by Obama this week, that places the U.S. in a state of national emergency? Most will choose to believe that this is business as usual, or perhaps not think much of it at all. Most will believe that the decision of Roberts to allow the implementation of this draconian 3,000-page bill is just the way he decided to vote. Perhaps, but perhaps there’s more to it than that. I believe that the ultimate ramifications of this ruling are being minimized, skewed, and downplayed, even by those in the conservative talk show arena. I also believe there’s more at play here than meets the eye. I’m not asking you to believe it, but I am asking that you open your mind to it. In the end, it’s all about control of the American people, and this is a giant leap in that direction. Think about it.